But before I announce the winner of big Social Media Hop blog giveaway, I'd like to thank you for all the sweetest comments you left here - both for myself and my Creative Team! Amy, congratulations and thank you so much for your lovely words! :) Please contact us via email (missmoth1@gmail.com) and send your mailing address to claim your prize! Artists find inspiration from many different places. For myself, a song fills my head full of ideas brought on from the lyrics and the music itself. While going through some of my vinyls while listening to some music, this project began to materialize – to use an old record as the base of my project! I then tried to focus on what MY song would be when "Rebel Heart" was the next tune that randomly played and I smiled knowing that REBEL would be my perfect title! 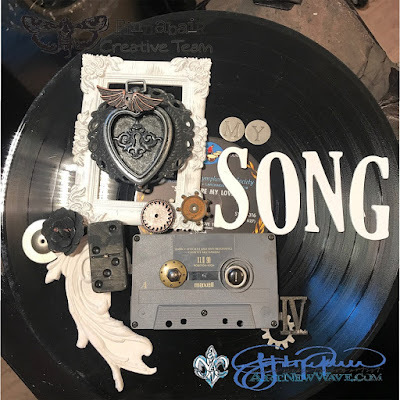 Join me in how I created my interpretation of My Song while I share some of my assemblage tips with you. As with most of my projects, I made a rough layout of where I wanted to place all of my embellishments and then took a picture to refer to later when I started assembling all of the pieces. This serves as my roadmap for my project as I progress, although many times it changes along the way as I decide to move things around and add more embellishments. To create the background, I used the Harlequin Stencil for the pattern using Sparks Raven Black as the base coat. Next I randomly applied Graphite Paste with a palette knife, leaving some of Raven Black to show through. 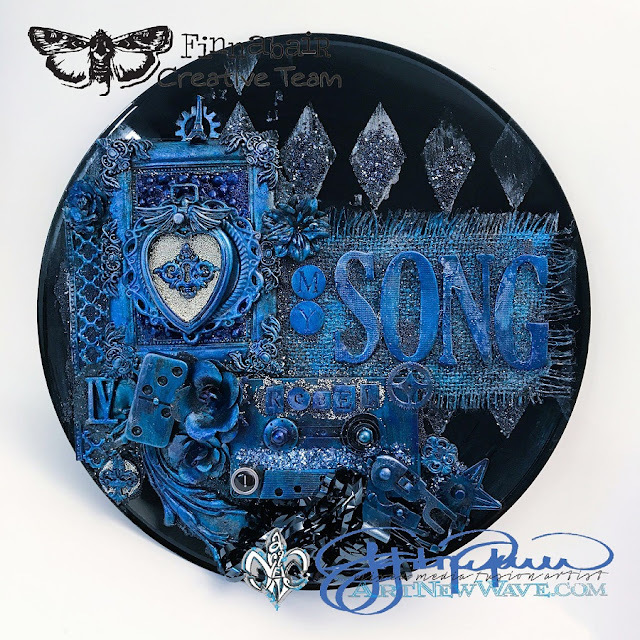 Without removing the stencil, I used some of my favorite inclusions to apply to the wet paste – Glass Glitter in Pitch Black and Midnight Blue, along with Micro Beads in Black and Splash. My 'go to' paste that I absolutely LOVE to use is Graphite Paste, and for this project I used it for both texture/color and as an adhesive for holding down almost all of the embellishments. And what project isn’t complete without Art Stones?! Once I placed the frame into place, I filled the background with Graphite Paste and then added the Art Stones and gently pushed them into the paste. Once dried, I painted the Art Stones with Metallique Midnight Sky. The embellishments used in the project all had a base coat of Black Gesso applied, followed with a coat of Sparks Raven Black and then highlights of Metallique Deep Waters and Midnight Sky. 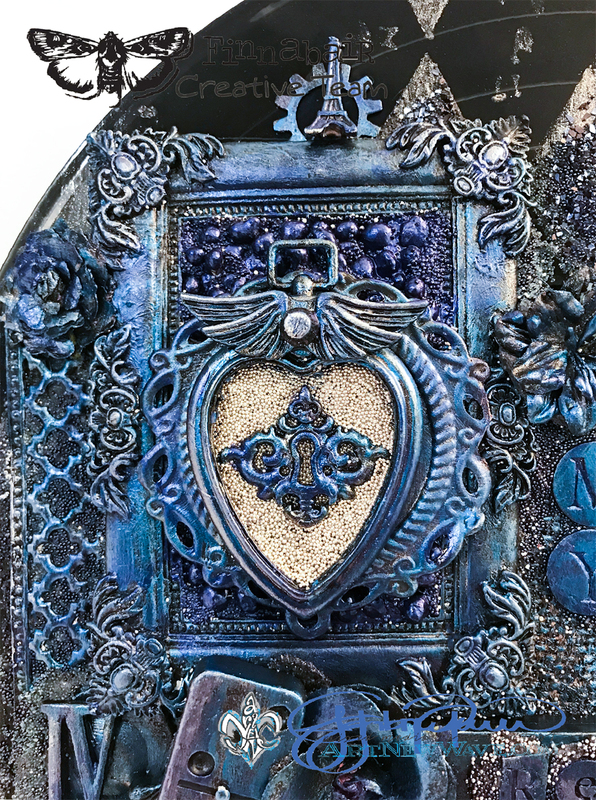 Once all of my embellishments were in place, I used Metallique Wax in Brushed Iron for highlights. Beneath My Song, I used a piece of burlap from the Fabric Pack which I colored in the same manner as my other embellishments used in the project. 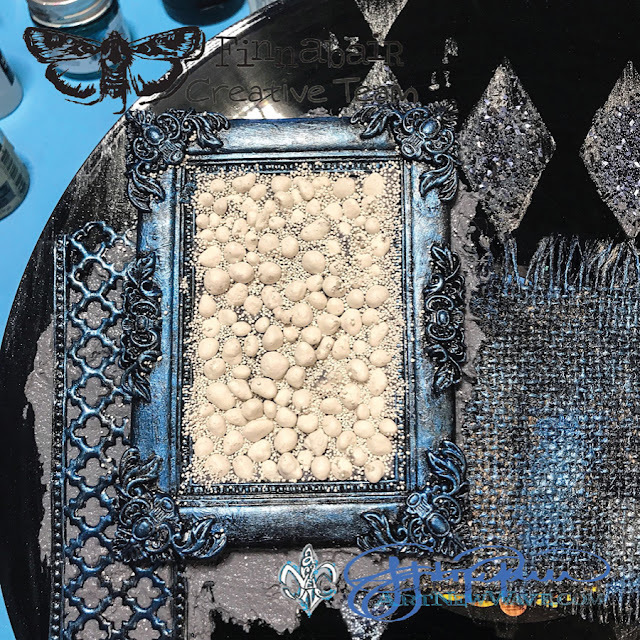 I love the look that you can create by painting the burlap – it makes burlap so versatile for many different projects especially after fraying the edges. 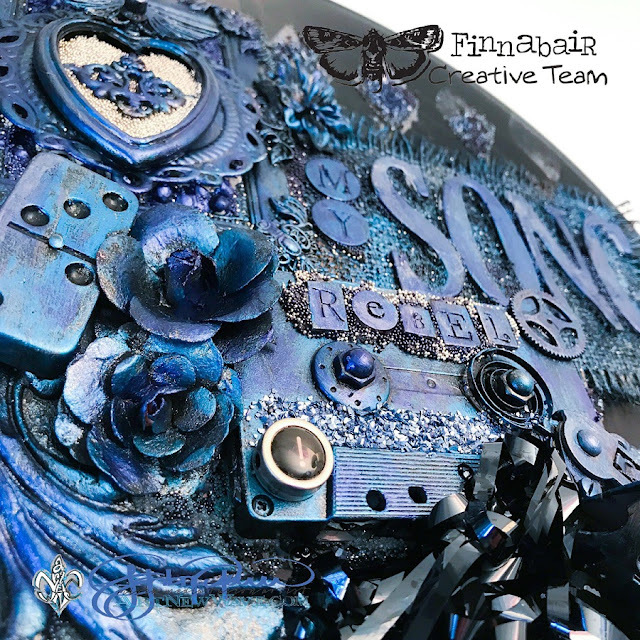 Since I used a record as the base of my project, I thought that it would be fun to also incorporate an old cassette tape to place REBEL onto. 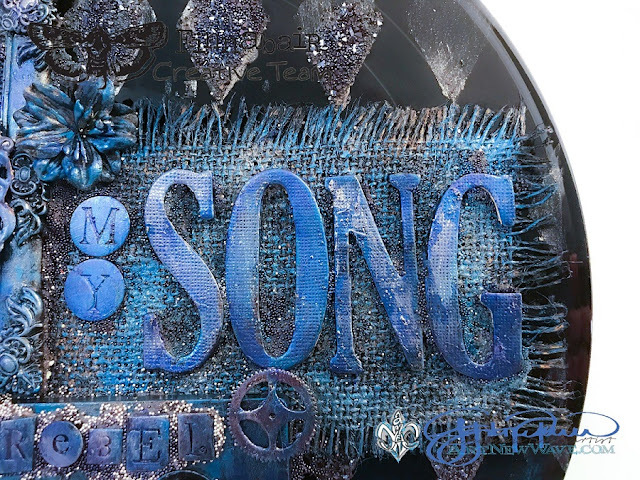 I hope that this project has inspired you to find YOUR SONG – whatever it may be…. 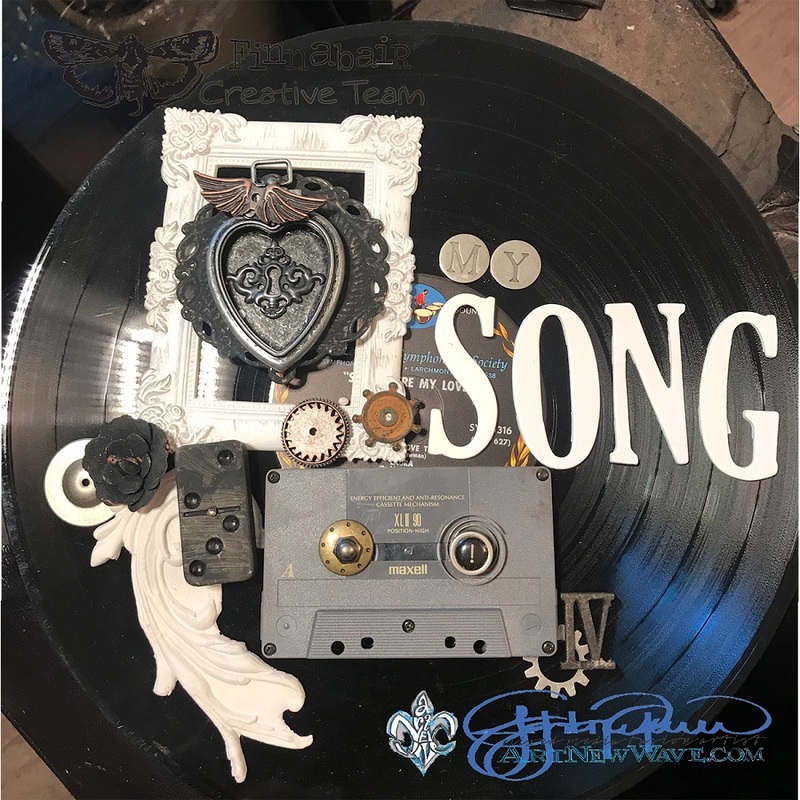 Listen to the lyrics, let the music move you to create a masterpiece that expresses your creative self! Congratulations Amy!! you are the lucky one! As usual, John amazes and inspired me! GREAT project!! Congrats to Amy and I love John's project! using a record as the substrate is so clever. Thank you so much. Super excited right now. I sent an email. This project is amazing!!!! Love the color too.